An Adverbs Read Aloud and FREE Activity! The book I found is called The Big Problem (and the Squirrel Who Eventually Solved It): Understanding Adjectives and Adverbs by Nancy Loewen. It is somewhat hard to see in these photographs, but the author used a red font on every single adjective in the book, and a green font for each adverb. HOW I INTEND TO USE THE BOOK IN A GRAMMAR LESSON! This book presents the perfect opportunity to help students understand why an adverb is an adverb. 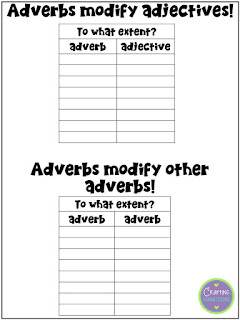 The adverbs are already identified, leaving plenty of time to analyze each sentence and determine which word is being modified by each adverb, and how it is modifying the other word. I recommend printing the two printables (shown below) back-to-back, so that it's on one sheet of paper, and then handing out a sheet to each student. 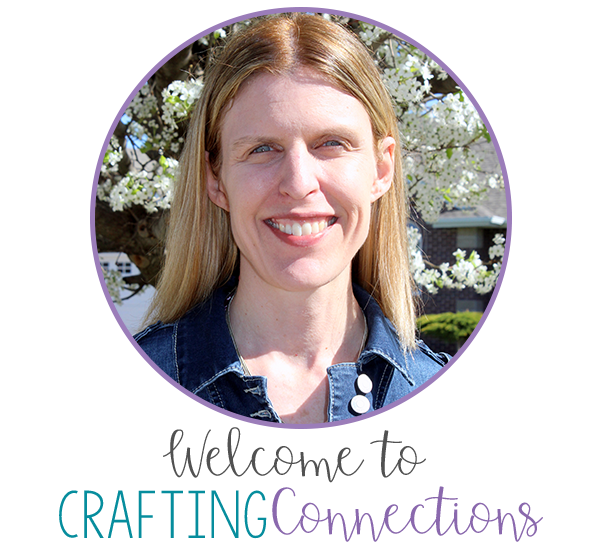 Click HERE to access these free printables! I intend to use the document camera to project the book so that every student can read the pages along with me (silently) as I read them aloud. 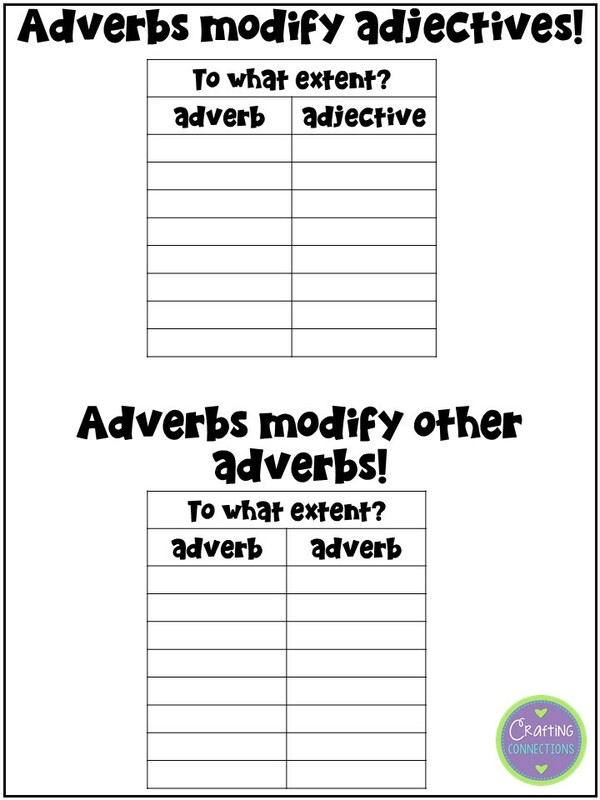 At the end of each page, identify the adverbs, one at a time, and have your students name the chart to which the adverb belongs. To do this, they must identify which word is being modified by the given adverb, and whether that word is a verb, adjective, or other adverb. If the word is a verb, they must also determine how that adverb is modifying the given verb. 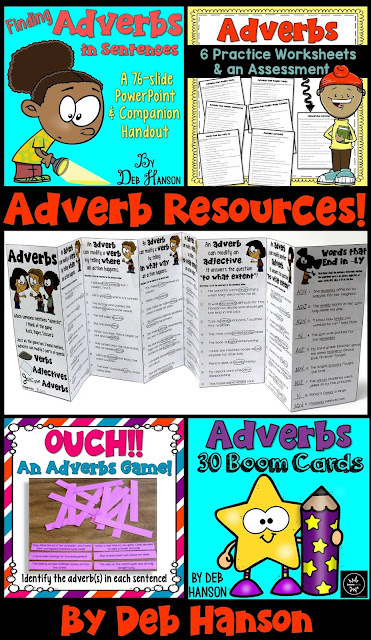 If you happen to be looking for a few more ready-to-go adverb resources to use in your classroom, feel free to check out my TpT store. 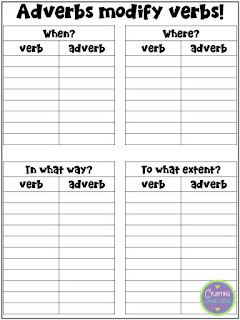 The image below shows the materials I created for teaching students about adverbs. If you click on the image, you'll be taken to the bundle in my store. 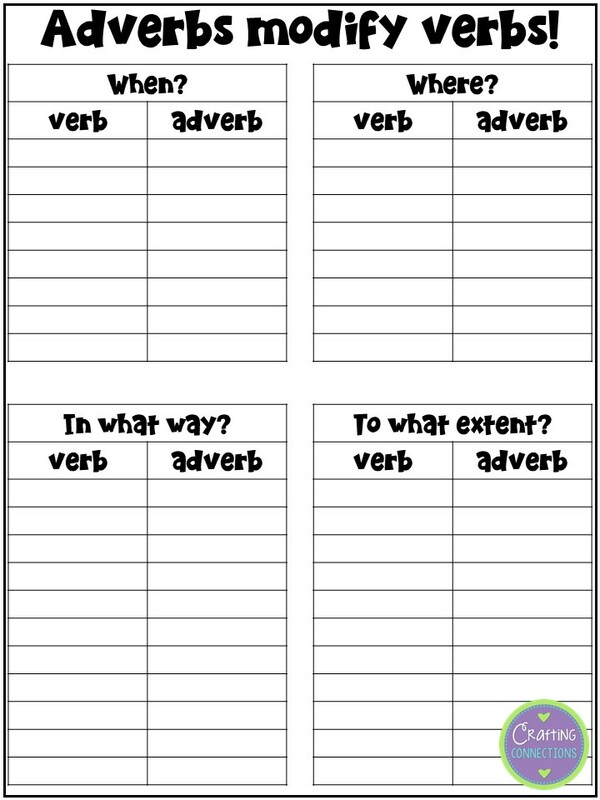 From there, you can also check out each individual adverb resource, as well. I hope you and your students enjoy this read aloud activity. Don't forget to hop over to my blog post at Upper Elementary Snapshots to view my adverbs anchor chart and freebie!